Private villas are the perfect place to celebrate a milestone birthday, anniversary or any special occasion in Los Cabos! 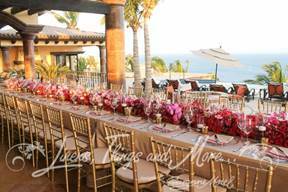 Notable floral designer Lucy (of Bella Flora in Texas) recently celebrated her birthday at the breathtaking Villa de los Sueños in the exclusive Pedregal community here in Cabo San Lucas. We pulled out all the stops to make sure Lucy’s birthday dinner décor was worthy of a professional creative event designer. 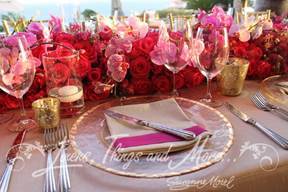 We think the photos prove this hot pink and champagne private villa birthday dinner was nothing short of flawless! By far the most impressive feature of this design was the elegant floral runner in Lucy’s favorite colors—hot pink and purple! We must send a huge thank you to Cabo Floral Studio for helping us incorporate this piece into our overall look for this birthday party. 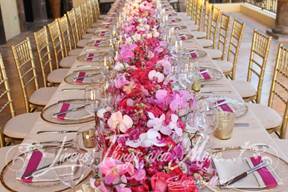 Building our design around the vibrant floral arrangement, we added champagne linen and gold and hot pink accents to complete this stylish, one-of-a-kind celebration. Thank you Lucy for the honor of designing your birthday dinner décor! We hope to see you again in Cabo very soon! 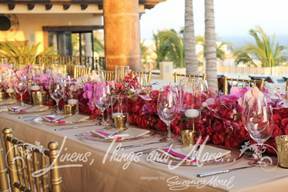 This entry was posted in Cabo Floral Studio, Cabo Flowers and tagged Bella Flora, Cabo Dinner Decor, Cabo event decor, CABO FLORAL STUDIO, CABO PRIVATE VILLA, elegant decor, floral runner, gold decor, Imperial table decor, Pedregal, pink and champagne decor, private dinner decor, private villa birthday, Sun Cabo vacations, Villa de Los Sueños.